April Stuck of the Month! "yes i was friggin stuck." oh, Carl! Your screw up earned somethin! Congrats! no darwin awards yet! That's one we'd rather not see ya earn. Bro. the darwin awards were created because of me. i've been shot by my own gun, stabbed in a bar fight between 2 girls, had a car on cement blocks fall on me, and ran over myself with a skidder that i was operating(large machine that hauls logs off a logging site). darwin hell, it needs to be named the carl awards! damn carl. you got some bad luck there. 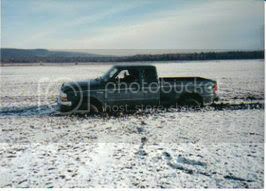 yeah... but my ranger is still stuck dammit. I have a beer on me carl. I'll make Ryan pay for it. R buy a beer for me....... he'd sooner ban me.